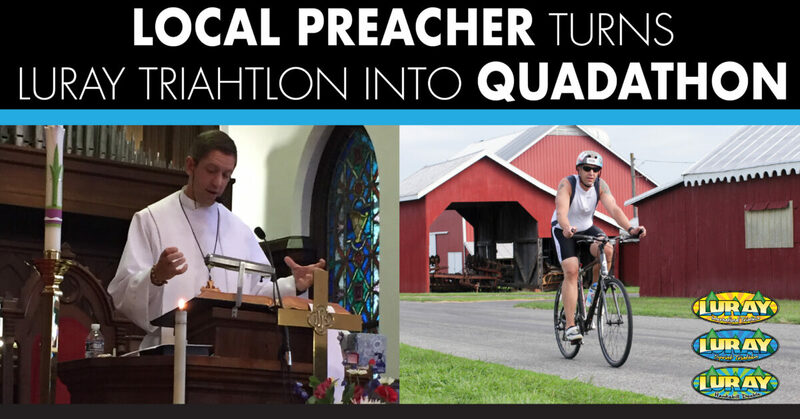 Erich Bennett, a local Luray pastor and frequent Luray Triathlon participant turned the “Tri”athlon into a “Quad”athlon, last year when he added a fourth event to his day. 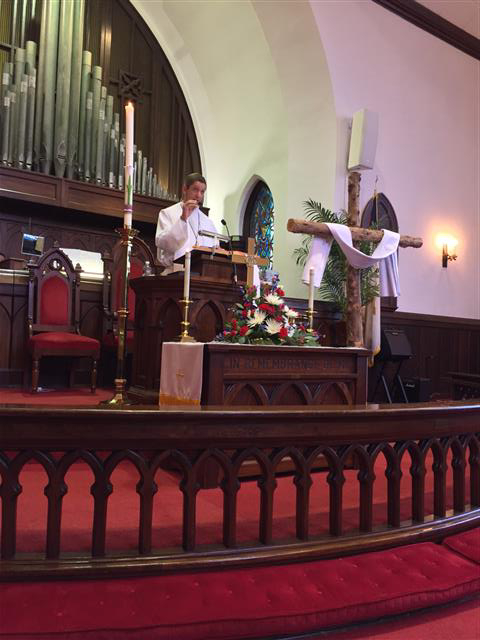 Immediately following the triathlon, Erich raced to his church, Luray United Methodist Church, just in time to lead worship and preach, making that his fourth event of the day. Friends joked that he didn’t just do a triathlon, but rather a quadathon. Erich got Local 3rd Place, but wasn’t around to hear it since he was already on to his next event. He found out he had placed 3rd when friend David Sours tagged him in a picture on Facebook. Sours is co-owner of Hawksbill Brewing which is the title sponsor of the Luray Triathlon Hawksbill Double. Luray Triathlon truly is a community event. We recently met up with Erich and asked him a few questions about his Luray Triathlon Experience. Q: Were you still in your racing clothing when you preached following the Triathlon? A: I definitely did not wear my tri-suit to lead worship. Those members who come to the race are traumatized enough by seeing me in that outfit, so I didn’t want to unleash that on the whole congregation. I’m all about sharing the shock of the Gospel, but I don’t want to alarm people in that way. Q: How did you feel standing up there preaching after just completing the triathlon? A: I was humbled by the experience because my heart rate really didn’t calm down like it needed to, so I was still pretty hyped by the time I got to preach. I don’t know if people could tell or not, but I was sweating pretty heavily during that message. Most people who don’t preach aren’t aware of how exhausting that can be, you put your heart into it, and it is a whole body experience, so at the end of that morning I was pretty spent. It’s pretty awesome though because each year we have folks that participate in volunteering at the Sunday race and they still come to worship, rolling in with their volunteer shirts on. They were still committed to come to worship afterwards, so I wanted to give it a go. Q: When did you first participate in the Luray Triahtlon? A: 2011. I was appointed to Luray United Methodist Church in July 2011, I had done some triathlons, and was excited to try one in my own neighborhood. I was still very new to the community, and the support of my new church family and folks from the community was such a great lift during the race. It also was one of the first times I had biked and run the route even though it was in my own backyard, and the experience gave me an added appreciation for the beauty of our region. Q: How many times have you participated in the Luray Triathlon? A: I competed in the International in 2011 and 2014 and I did the Sprint in 2016. I also volunteered one year. Q: What was it that made you want to do Luray again? A: For the reasons I mentioned above. Plus, the triathlon has done such good things for our community. The visitors gain an appreciation for our region’s beauty and their contributions to Lake Arrowhead, and our community is a blessing. Plus, the triathlon community is so uplifting. Everyone competing is rooting for everyone else, there is certainly competition, but also a real desire to encourage fellow racers. This is a draw for me. Q: When you volunteered what did you like best? A: Volunteering is great because it gives you a chance to encourage racers, just as in the race. It also gives me as a resident a chance to be a welcoming presence to those who are coming to Luray to race. Q: When you participated what did you like best? A: It is great because I know so many of the folks involved. I recognize the folks at the aid stations, and directing on the bike course. I know the folks marking my body with numbers, and I love the chance to participate in this great event in my own backyard. Erich plans on participating this year in the Luray International Triathlon on Saturday so he can enjoy the after-race time and have time to give high fives and relax for a bit with his family.